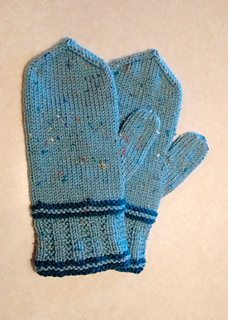 These fingerless mitts and mittens both start at the wrist with a garter rib. The gusseted “sore thumb” sits at the side so they can be worn on either hand. The mittens decrease to a point at the top. 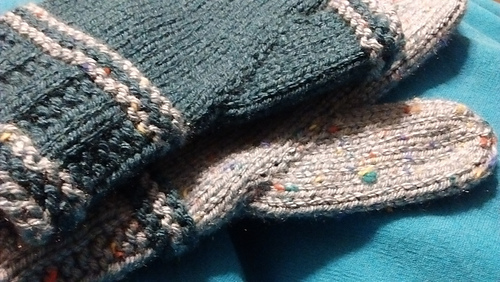 The fingerless mitts end with garter stitch rounds to match the cuff. Three sizes are included in this easy, knit and purl design. The small amount of contrast color used make these a great pattern for using up your leftovers. Think of the variations you can make! Around palm of mitts or mittens: 7.2 (8 , 8.8)” 18 (20, 22) cm. 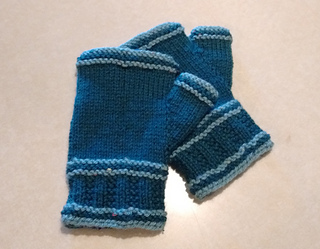 Cuff length: Fingerless mitts 2.5” 6.3cm, Mittens 3.25” 8.2cm. Hand length from top of cuff to top of mitt: Fingerless mitts 1.5” 4.5cm, Mittens 5.5 (6.5, 7.5)” 14 (16.5, 19) cm. 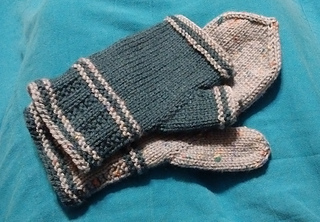 Thumb length: Fingerless mitts 1 (1.25, 1.5)” 2.5 (3, 3.5)cm, Mittens 2 (2.25, 2.5)” 5 (5.7, 6.3) cm. Fingerless mitts: Main Color: 97 (107, 118) yds 89 (98, 108) m, Contrast Color: 28 (31, 35) yds 25.6 (28.3, 32) m.
Mittens: Main Color: 132 (147, 162) yds 121 (135, 149) m, Contrast Color: 16 (18, 20) yds 14.6 (16.5, 18.3) m.
20 sts x 29 rnds to 4” 10cm in stockinette. 18 sts x 32 rnds to 4” 10cm in Garter Rib.